Two blogs in one week? Has the world gone mad?? I couldn’t just leave you all wondering what happened next on our big French adventure, so here I am – back with part deux. After a wonderful week in Annecy, playing on the lake and whizzing down the mountains, it was time to move on. The temperatures in Annecy were getting unbearably hot and we’d heard of this little range of hills that were not too far away, called The Alps. So, we packed up our van, deflated our inflatable awning (those things are genius by the way!) and set off east to the little mountain town of Chatel. 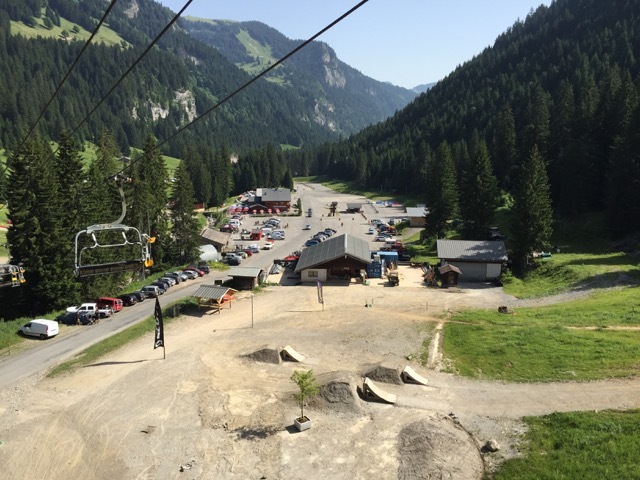 I’d mostly heard of Chatel as a ski resort, but in summer you’ll find it alive with the sound of mountain bike hubs. 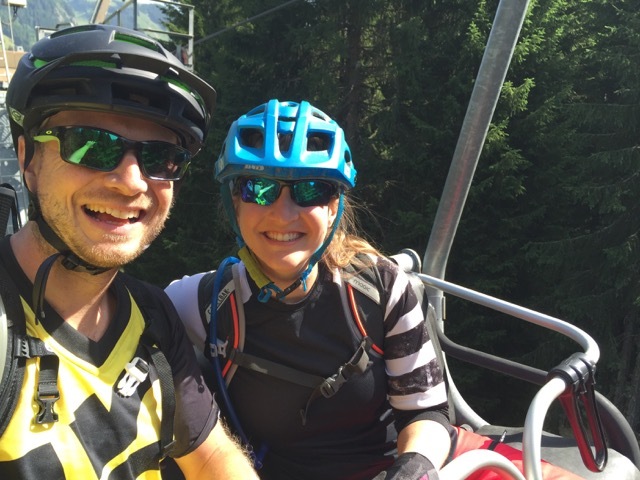 It’s part of the area known as Portes Du Soleil, a veritable playground of bike parks, which also includes Les Gets and Morzine, among others. When we arrived in this chocolate box town, I started to feel a little nervous. All the people with bikes appeared to be wearing full face helmets and those biking clothes best described as pyjamas. Eek, I didn’t have either of those items tucked away in my luggage! But we found our campsite and set up camp, enjoying the beautiful mountain scenery that surrounded us. That evening we enjoyed a pizza in town, before hooking the laptop up to the electrics, to watch some mountain biking videos – namely Dudes of Hazzard – to give me some inspiration for the next day’s ride. I went to sleep dreaming of berms and dusty trails. We woke up bright and early, eating a hearty breakfast of granola and tea to set us up for a day on the trails. As in Annecy, Chatel was really set up for biking. There’s a free shuttle bus that picks mountain bikers and their bikes up from various points through the town (including a stop right by our campsite), dropping them off at the foot of the ski lift in the nearby bike park. I’d never been to a bike park like this before, and I have to admit that I felt somewhat daunted. I didn’t know how things worked, how you got your bike on the lift, what pass we needed or what the trails were going to be like. But we followed everyone else and got in queue for a lift pass. Once that was purchased, it was time to try the lift for the first time. I’ve never skied or snowboarded, so this really was a new experience for me. The lifts at the bottom of Chatel are the open ‘bench’ kinda ones, where there’s a bar that comes over to keep you tucked in. But you can’t sit down before you’ve got rid of your bike, which is an art form in itself, and one I failed to get right the whole day! Basically, we had to upend our bikes, standing them on their back wheel and then hook them into a nifty contraption on the back of the seat in front of the one we then sat on. It was an awkward manoeuvre and the lift attendant lady had to help me every time. She didn’t look best pleased! Happy faces after we made it safely on to the lift for the first time! We made it safely to the top of the first lift, before heading up further still in the next, slightly different one. On this one the people were much more friendly and happy to help with the bike hooking manoeuvre! Reaching the very top of the bike park took us to some stunning views of the surrounding mountains and valleys. It was pretty impressive stuff. We made our way to the start of a green trail – the easiest grade. I was sooooo nervous as the Pyjama Warriors, with their full face helmets and hired downhill bikes, came zooming past at the trailhead. But it was time to give it a go. So off I went! The trails were very much man made, fairly wide, with berms and jumps built in, and the ground was dusty hard pack. I didn’t like it. So, we tried another…. more of the same. And another, which did have some roots, but not enough for it to quell my desire for some tricksy, technical riding. I’m sure there was tricksy, technical riding available, but it was on the harder trails, with the gap jumps and the majority of the Pyjama Warriors. After stopping for lunch, I had a little melt down. I really didn’t like it here. I wanted to like it, but I just didn’t. I like complicated, technical, puzzle-it-out riding. High speed whooshing is less my thing. High speed whooshing surrounded by people who love high speed whooshing is even less my thing. I wasn’t very happy. So, the Mr and I had a good heart to heart. I thought I was letting him down by not liking the riding and not wanting to be there. He assured me this was nonsense and that we could move on to somewhere different, where the riding would suit me. Bike parks are just not my thing.